HUNGRY caterpillars have put Woking residents on high alert after experts warned they pose a risk to foliage, animals and even people. Locals are being advised to be vigilant after the discovery of oak processionary moth caterpillars elsewhere in Surrey. 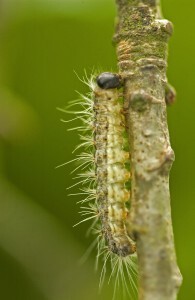 The bugs cause significant damage to oak trees by consuming their foliage. Residents are strongly advised not to touch the caterpillars or interfere with their nests as their microscopic hairs contain a toxin that is known to cause itchy skin rashes, eye irritation and sore throats. Councillor Beryl Hunwicks, Portfolio Holder for Health & Wellbeing Development, said: “We’d like to reassure residents that, while there have been no reported cases of oak processionary moth caterpillars within the borough, we are aware of cases elsewhere in Surrey. “We are currently working closely with the Forestry Commission and landowners to monitor the situation and ask that local people be vigilant. Please don’t touch or try to remove the caterpillars or their nests. As the name suggests, they move in nose-to-tail processions along oak trees or on the ground and often cluster together. They build white, silken webbing trails and nests – usually dome or teardrop-shaped – on tree trunks and branches rather than among the leaves. The Forestry Commission can be contacted on 0300 067 4442, by sending an email to opm@forestry.gsi.gov.uk or by visiting forestry.gov.uk/opm. For Woking Borough Council’s Arboricultural Officer call 01483 755855 or send an email to tree.preservation@woking.gov.uk. For all further information about oak processionary moth caterpillars, visit woking.gov.uk/environment/greeninf/tree/opm.